Yay! 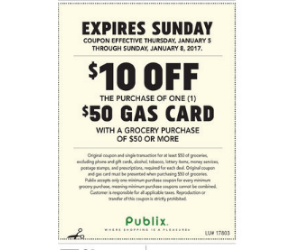 Publix has the Gas Card Deal this week! That means when you buy $50 in groceries, you can purchase a $50 gas card for only $40! Combine this offer with coupons and bogo sales to save even more! This deal ends Sunday, January 08, 2017. Happy Shopping!